Automattic recently published 📺‘A meditation on the open web’, a 3:18 minutes video in which the viewer is taken on a visual journey that compares Facebook to a smoggy metropolis and Instagram to a Potemkin suburbia. As the suburbs fade into the distance the rest of the world comes into focus on the horizon. You see farmsteads in remote corners of the countryside. You see riverside factories. You see backpackers on mountainsides. You see small settlements and emerging new cities. You see apartment buildings and straw huts, sprawling homesteads and local churches. This diverse group of people value their freedom […] They want ways to make their houses bigger and stronger, tools to make their business more valuable for customers, and roads to connect them to other people. 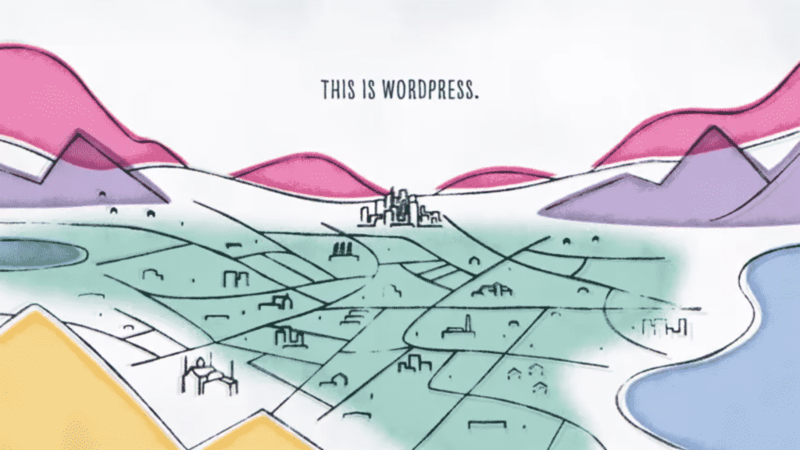 This is WordPress. Obviously, unless you’re busy plugging your head up your own arse in an attempt to rectify what is reality around you according to your own very unique set of standards, you immediately will have noticed there’s a lot of stuff missing from that picture, even for a metaphor. Where is all the debris from the stuff people break on their websites, or worse, on the sites of people who trusted them? Where are the decadent page sizes clogging global bandwidth? What about the filthy little foot note that most of the 67% of small businesses globally who don’t have a website yet won’t or can’t even consider getting one, but probably will set up Facebook pages instead? The open web, and WordPress as a representation of it – a middle-class neighbourhood whose inhabitants believe themselves to be valuing freedom while their shortsightedness, privilege, biases, greed, and misuse of common resources continues to drives masses into the smoggy cities who promise to provide one thing fast: access. Yup, I agree. That’s part of what WordPress is. Let’s go change it for the better.